I have a thing for riding boots, the kind of boots you pull on that make you feel like you'd fit right in in your jodhpurs and black cashmere turtleneck meeting pals William & Kate for a pint in SoHo on a sunny Saturday afternoon. 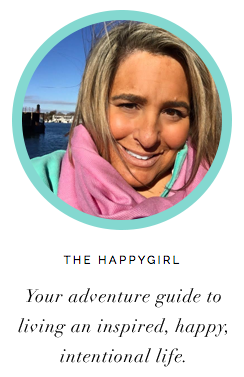 The problem with riding boots is that they can be high maintenance and in inclement weather, your feet will get uncomfortably soaked. 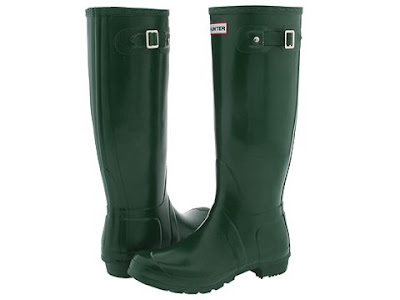 There are, of course, the iconic green Hunter Wellington boot, the footware that will keep you dry yet looking like you ARE wearing rainboots and you just might have dashed out in the middle of gardening. 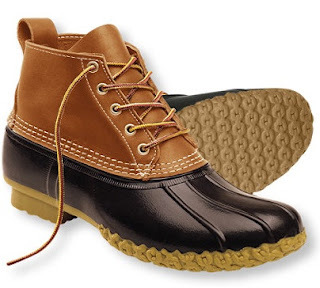 these are the llbean boots I wore throughout high school and college. Enter the Hunter Champery black boot with the wedge heel, the boot that you can wear in the city to meet your stylish friends at a pub as well as a walk along with country moors with your dogs. Imagine your Hunter Wellies + your Frye riding boots hooked up and the result was a fashionable workhorse of a boot with impeccable heritage and Vulcanized rubber to keep your feet cozy and dry and after all, dry feet are happy feet! Bonus #1: They're comfortable. I could walk Manhattan blocks in these. Bonus #2: They make your legs look looooooong. Now, just in case you are called to meet those friends in a pub, you'll be ready to roll.